OMG! What a great book! I could not put this book down! A cross between The Shining and Where The Wild Things Are…What if the monsters you imagine really do go bump in the night?! A doomed ship wrecks off the coast of Maine over a century ago, and still the screams can be heard floating off the water… or is it just the whistling of the wind? All hands were lost at sea, some young children… do they cry for revenge? And a little boy caught in his own mind, draws the monsters in his head… or are they visions of something else? Tim and Holly, Fred and Nell, two couples living similar lives, outsiders by long time Maine residents standards, giving birth to boys just about the same time and best of friends - the boys, Jack Peter & Nick, and the couples. J.P. and Nick grow up together, friends from the start, but then a near tragedy happens and launches J.P. into a world of his own - inside, never venturing outside, literally. A near drowning makes JP afraid to go out of the house, with only his friend Nick to pass the time with him inside. But then strange things start to happen… a bump in the night, a strange ghost like monster lurking outside, scratching at a bedroom door. And all along, Jack Peter feverishly drawing… the monsters in his head… the monsters heard in the night. A priest, a one-eyed Japanese house servant filled with ghostly tales, and two imaginative boys whose parents think nothing of their screams in the middle of the night… until it's almost too late. What's real and what's imagined?! I was holding my breathe in spots and could feel my heart racing. This is one book filled with all that great edge of your seat tension until the very end, where a bone chilling twist made me want to read the book all over again! 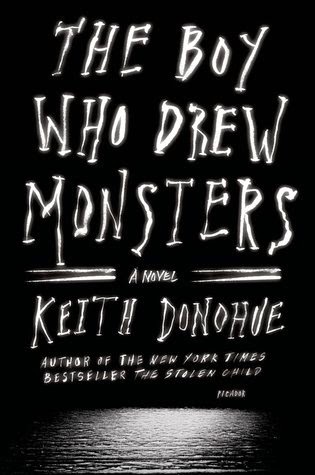 If you like ghost stories or if you like horror novels, you'll love The Boy Who Drew Monsters by Keith Donohue! This is truly heart stopping in spots. The writing is solid, the story is great and the ending trumps it all! Warning… don't turn the lights out until you're finished reading this and then make sure you look under the bed first!